Last year we were able to purchase a George III teapot & matching stand, which was made by Henry Chawner in 1791. After receiving it we became intrigued to learn more about the piece and especially the unusual family crest which was engraved in the cartouches on both sides of the teapot and also on the stand. 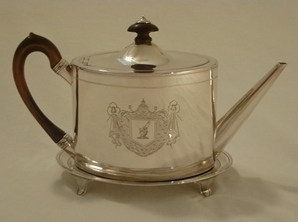 As noted in one of our previous articles (see at http://www.ascasonline.org/WINDOWLUGL86.html), we have a set of criteria by which we judge each of our purchases, and one of our first checks is to confirm that the teapot & stand are an original pair. 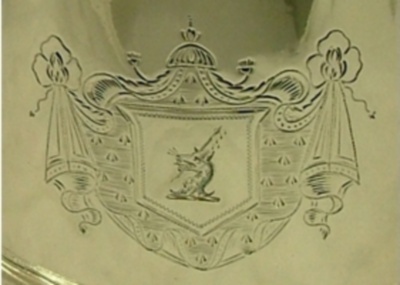 A quick look at the hallmarks confirmed that both the teapot & stand were made by Henry Chawner in 1791. The condition of the engravings was excellent and rated a 9 on our scale of 10. The teapot’s only flaws were a slight crack and small chip in its finial and a very small ding at its base on the left side. There were no visible repairs and the hinge was in good condition. 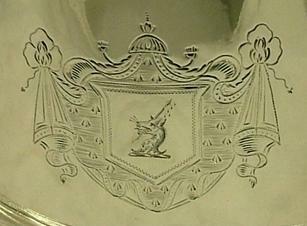 Our interest next turned to the cartouches and the family crest engraved in each of them. The first question that arose was whether the cartouche and crest engravings were contemporary with the pieces or added at a much later date. 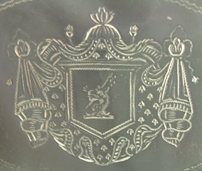 Since many of the cartouche designs were used well into the 20th century we have found the best way to determine if they might have been engraved contemporaneously is to look at other pieces from the maker and check for similarity. 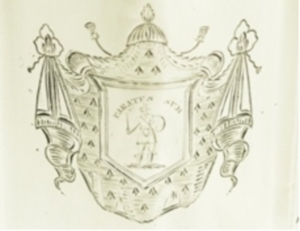 In the case, we have found several other instances of the same cartouche being used by Henry Chawner (and others) at around the same time (1790-1792). 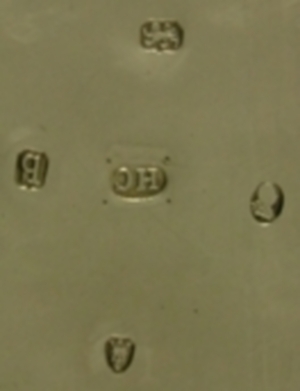 Therefore we concluded that someone in Chawner’s shop likely did, or contracted out, the engraving. The three examples pictured below helped support that conclusion. As for the crest, it was hard to say upon initial examination whether it was added at the same time as the cartouche or a bit later. 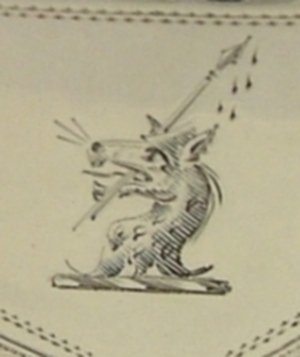 However that question quickly became secondary to exploring the origins of the unusual crest, which depicted a dog or wolf’s head holding what looked like a broken spear in its mouth. In true Sherlock Holmes fashion we tried to approach things logically. Having some understanding of heraldic blazon, we tried to translate the crest into blazon as best we could. The head was clearly "erased" (i.e., head with curling neck fur, as if torn or hacked from the body, rather than being cleanly cut). It also appeared there were some drops at the end of the spear, which we figure could possibly be blood. Our first attempt at translation was "a wolf's head erased, holding in its mouth a broken spear" (we omitted the drops since we were not sure how to describe them). Being the crest was engraved on silver, we did not include any reference to colors in our description. Armed with our rough translation we immediately searched the phrase in an electronic copy of John Burke's, Genealogical History of the Landed Gentry, Volume 1. To our surprise we had a hit on our first attempt. Burke described the Baskerville family crest as "A wolf's head, erased, arg., holding in its mouth a broken spear, staff, or., head arg., imbued, gu." Since imbued means "stained with blood", we figured our original speculation might be correct and the drops were indeed drops of blood. Excited by our early success, we began to aggressive research the Baskerville family (we also began feeling closer to Sherlock since one of his most famous cases involved the "Hound of the Baskervilles"). Fortunately, we almost immediately discovered an article on "Early Baskerville Family History" by Brian Erwin and edited by Peter Baskerville Rance (1990). 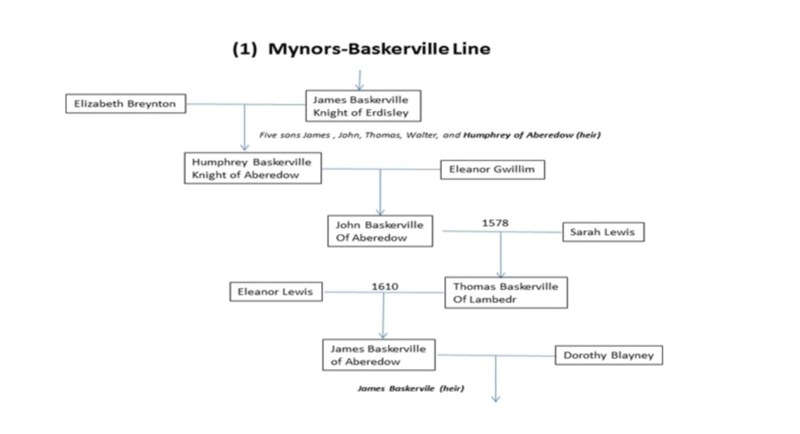 This article describes the family's history up until around 1600 and reading it made us keenly aware that the Baskervilles were an old a distinguished British family. "The Baskervilles have a truly royal ancestry, and their pedigree, which has been authentically deduced and duly registered in the College of Arms, is a large one. Burke writes of the family as 'one of the most ancient and honorable in England'. Their connection with Herefordshire began with the ancestor who came over to help William the Conqueror, from Normandy. Erdisley or Eardisley was the Herefordshire stronghold of the Baskervilles, called 'Herdeleg'' in the Domesday Survey. The castle of those days stood in a forest, of which it is said the great oak of Eardisley, was still standing in 1907. The first Baskerville (died 1109) who is mentioned as living in Eardisley castle, about forty-three years after the Conquest, was one Robert, a knight, whose wife Agnes, was daughter and heiress of Nasta, daughter of Rees ap Griffiths, Prince of South Wales." 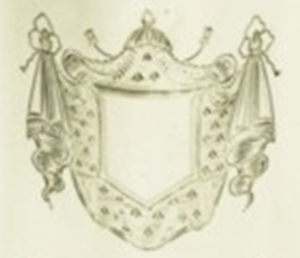 "There are many Baskerville arms but those given to the Hereford line are appropriate to a family who have lived so much on the border of Wales and are now residing in the Principality. The crest is a wolf's head erased holding in its mouth a broken spear with five drops of blood. In 'olden times' wolves were hunted in Wales to exterminate them and no doubt some brave act of saving life from a wolf's clutches may have given rise to this heraldic cognizance." It appeared we now had confirmation that the crest was that of the Hereford, or Eardisley, line of the Baskerville family. However the teapot and stand were made in 1791 so we were interested in learning more about the Baskervilles at around this period. 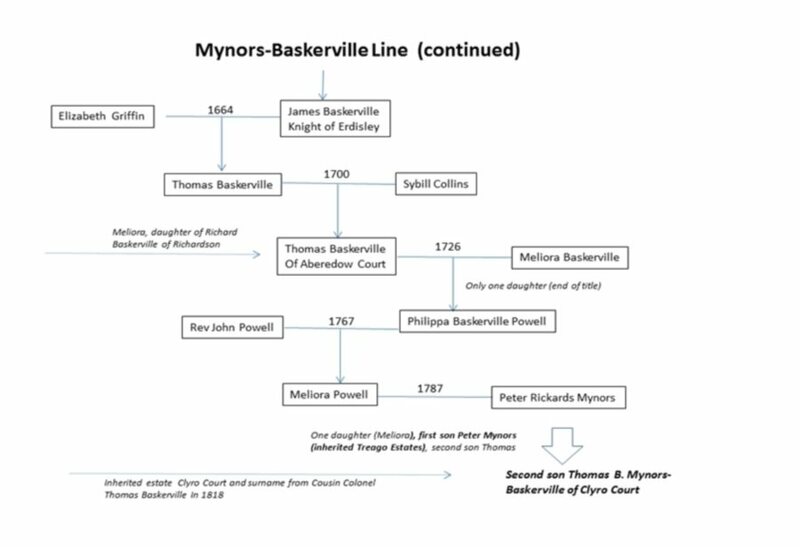 Therefore we went back to Burke's book where we noted that Colonel Thomas Baskerville died without heirs in 1817 and willed the family arms to his cousin Thomas Baskerville Mynors, thus creating the Mynors-Baskerville line. Therefore it appeared that Colonel Baskerville could possibly have been the original owner of our teapot & stand. 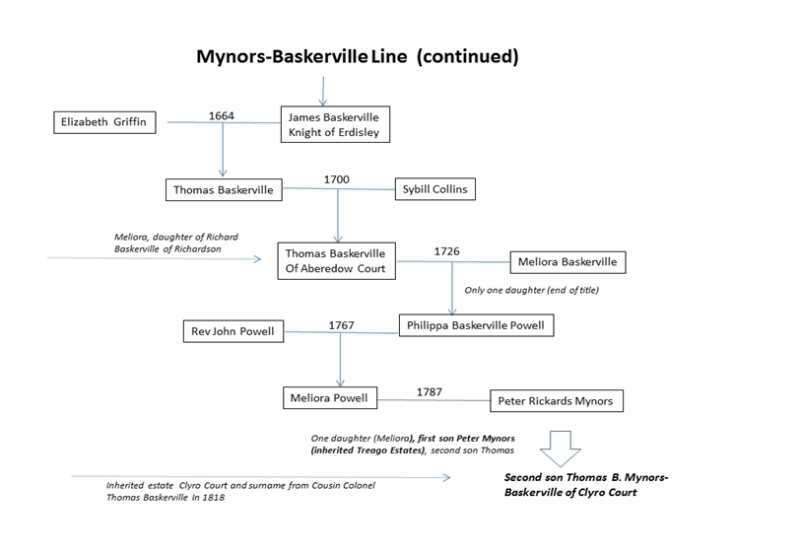 At this point we had gathered enough information to put together the Baskerville lineage from the early 1600s through to the inheritance of the title by Thomas Baskerville Mynors in 1817 (we have included a copy at the end). Changing our tack, we felt it might be interesting to see if there were other pieces of silver with the Baskerville crest so we half-heartedly typed "Baskerville, silver" in our Google search box. As is typical, there were thousands of hits. As we scanned the headings, one caught our attention on the fourth page. It was titled "Hidden Baskerville Cutlery Sale" and was from a BBC broadcast on June 1, 2008. "A set of 200-year-old silver cutlery belonging to the family which inspired the Sherlock Holmes classic The Hound of the Baskervilles is for sale. The 42-piece set spent 63 years hidden in a wardrobe on the real Baskerville estate at Clyro Court near Hay-on-Wye before being discovered by an expert. Holmes author Sir Arthur Conan Doyle wrote his great thriller at the Powys estate and was a friend of the family. 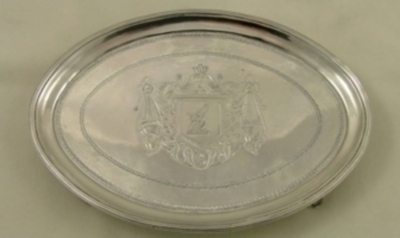 The present owners of Clyro Court came into possession of the unique silverware when they bought the estate in 1945 when it was sold for death duties. The pieces lay hidden until being discovered by antiques expert Martin Heath, who was asked to evaluate their home's contents following the death of the owner's husband. 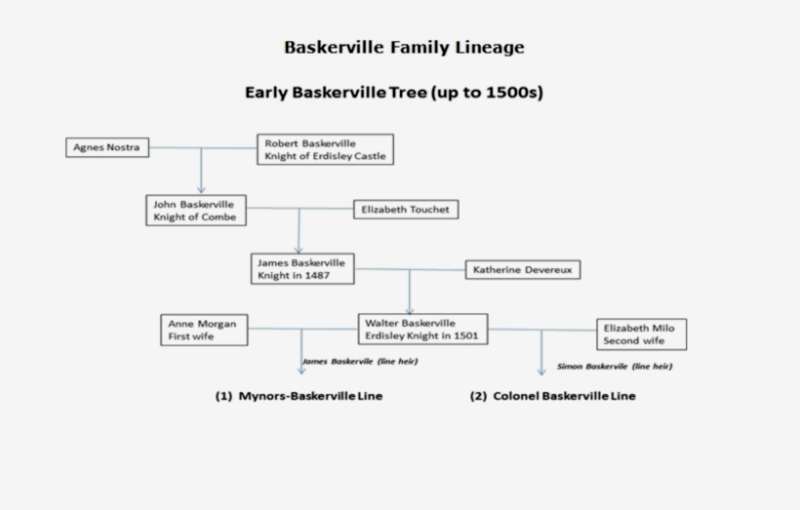 Mr Heath described the discovery as "unbelievable" with the Baskerville family crested silver dating back to the 1780s - the earliest recorded for the family. The crest is on every piece of the dinner service and shows a hound with a broken spear through its jaw with five drips of blood falling from its tip. The hound on the crest is said to be "Black Vaughan" who, as local legend has it, roamed the nearby moors of Hergest Ridge and was the inspiration of Conan Doyle's book. The crime writer is said to have written his most famous novel at the Baskervilles' old home, which he stayed at often during the late 19th and early 20th Century. He released the book in 1901, but the Baskervilles asked Conan Doyle to change the book's setting to avoid too many fans finding their home and adding to its intrigue." "Another earlier article in the Shropshire Star on May 7, 2008 provided a bit more information. "Mr Heath described the discovery as "unbelievable" with the Baskerville family crested silver dating back to the 1780s - the earliest recorded for the family. 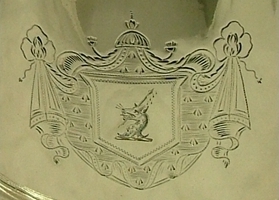 The crest is on every piece of the dinner service and shows a hound with a broken spear through its jaw with five drips of blood falling from its tip. He added: "I really don't know how these pieces have stayed hidden for 63 years. 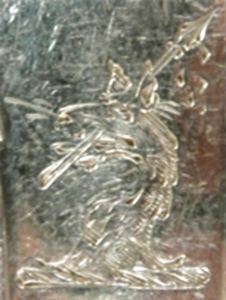 It is rare to find one piece of silver with the Baskerville mark but finding 40 pieces is unheard of. There is a strong connection between this silver and Arthur Conan Doyle’s book." David Hodby, current owner of Baskerville Hall Hotel, Clyro Court in Hay on Wye, said: "The cutlery is not mine to sell but a trader who visited here has them and I’m told they are solid silver and in perfect condition, even though they are very old. This is the original house of the Baskervilles and the same family crest features throughout the hall’s stonework and in all the gables. I didn't know about the cutlery and its discovery came as a bit of a shock." The crime writer is said to have written his most famous novel at the Baskervilles' old home, which he stayed at often during the late 19th and early 20th Century. The silver is believed to have been used at the fine banquets Conan Doyle would have attended during his numerous visits to the house in the late 19th and early 20th century." With this added insight, our investigation now moved in a new direction. Could our teapot & stand somehow be associated with the Mynors-Baskervilles, Clyro Court, and the visits by Sir Arthur Conan Doyle? All at once we could envision Sir Arthur pouring an afternoon spot of tea from our pot as he sat back to mull over Sherlock’s new mystery on the moors. We even went as far as researching Sherlock's favorite brand of tea (FYI: it's Lapsang Souchong, a smoky tea that is reminiscent of camp fires ... and briar pipes). But at last sanity set in and logic began to once again prevail. 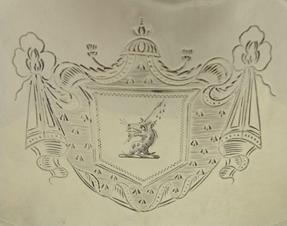 Comparing the crests on the teapot & stand with those on the cutlery it was apparent they were virtually the same. "These armorial bearings undoubtedly commemorate the marriage of Thomas Baskerville Mynors-Baskerville, of Clyro Court in the County of Herefordshire and Anne, daughter and heiress of John Hancock, of Marlborough in the County of Wiltshire. They were married in 1818 a year after the manufacture and hallmarking of this particular pair of salvers. Thomas Baskerville Mynors-Baskerville was born in April 1790, the son of Peter Rickards-Mynors and Meliora Powell (whose maternal grandfather through her mother, Philippa was Thomas Baskerville, of Aberelow Court whose wife was Meliora, was in turn the eldest daughter of Richard Baskerville, of Richardston). 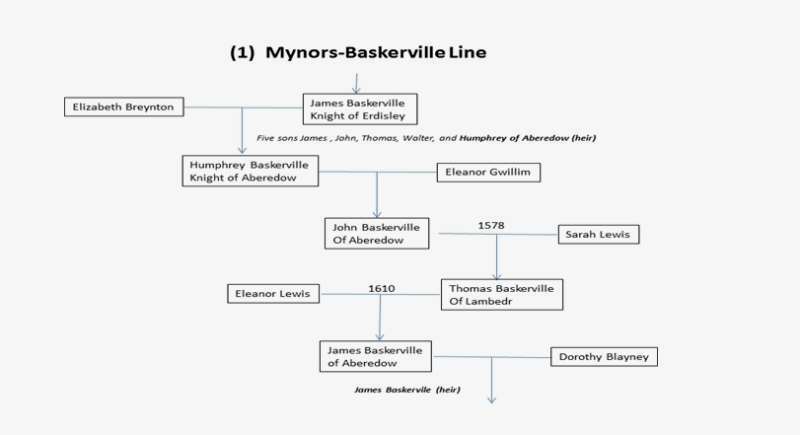 On the death of his cousin, Thomas Baskerville (the grandson of Richard Baskerville) in 1817, Thomas Baskerville Mynors (as he was styled then) succeeded to the family estates and assumed by Royal Licence, the surname and arms of Baskerville. 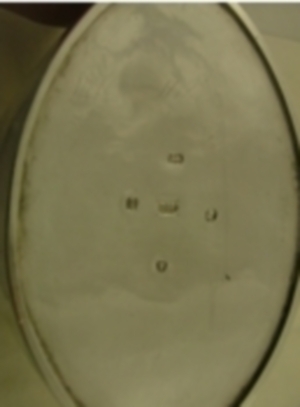 So we may assume that this pair of salvers was purchased and engraved after this particular event. Thomas Baskerville Mynors-Baskerville was a Justice of the Peace and Deputy Lieutenant and served as Member of Parliament for the County of Hereford. He also was High Sheriff of Wiltshire for the year 1827. After the death of his wife, Anne in 1832 (this marriage having no children), he married a second time on the 2nd March 1837, Elizabeth Mary, eldest daughter of the Rev. Powell Colchester Guise. This marriage produced six children (three sons and three daughters). Thomas Baskerville Mynors-Baskerville died on the 9th September 1864. He was succeeded in the family estates by his eldest son, Walter Thomas Mynors-Baskerville." 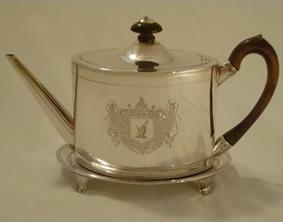 The S. Younge & Co. salvers were made over twenty-five years after the Clyro Court cutlery and our Chawner teapot & stand. 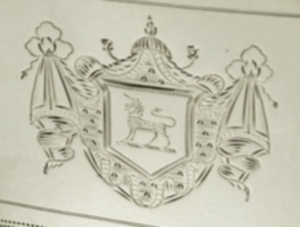 So the question arises as to whether Thomas B. Mynors-Baskerville inherited the cutlery (and possibility the teapot) already engraved with the crest, or did he have it added (after he assumed the surname and arms) to un-engraved pieces he inherited from his cousin? 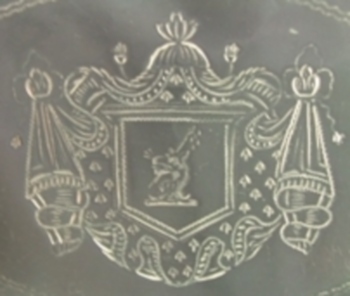 We feel it is unlikely Mynors-Baskerville purchased 25-year old silver without any engraving and then had his family crest added. His position and wealth would have allowed him to have such serving pieces commissioned, as appears was the case with the silver salvers mentioned above. Since Thomas B. Mynors Baskerville inherited Colonel Thomas Baskerville estate it is likely that this was where he obtained the silver cutlery discovered at Clyro Court. Even though Colonel Baskerville was married twice, he had no heirs. He did have a sister, Meliora, who died unmarried in 1773, so it was impossible for her to have ordered the silver pieces (they were crafted in the 1780s). Our research indicates that if the teapot was owned by Colonel Thomas Baskerville, it might have been purchased when he took up residence at Poulton House in Wiltshire around 1790. He was 59 at the time and we assume married to his second wife. The teapot and stand might have been a part of his normal purchases of household furnishings. Pulton House was built in 1706 and is regarded as one of the premier Queen Anne homes in England. Likely it will be impossible to ever determine that our Henry Chawner teapot & stand were present at Clyro Court during the time of Doyle’s visits. However it is possible they were at one time a part of the same Baskerville family silver as the cutlery pieces found at Clyro Court in 2008. This is based solely on the closeness of their manufacture as well as the similarity of the crests on the teapot & stand and the cutlery. Since Thomas B. Mynors-Baskerville inherited both the Clyro Court property and other Baskerville family belongings from his cousin, Colonel Baskerville, the teapot & stand could have come along with the cutlery. Since the silverware and teapot & stand were made in the late 1780s and early 1790s, and the Colonel died in 1817, there was a good chance they were still a part of his belongings at the time of his death. For fun, we purchased a copy of the USA, first-edition of Hound of the Baskervilles (McClure, Phillips & Co., New York, 1902) to accompany the teapot & stand. For us, passing by the combination stimulates a vision of Sherlock Holmes being served tea from a Baskerville family teapot -- the crest with the wolf, broken spear, and five drops of blood reinforcing in his mind the supposed family curse and the possibility of a murderous, hound-like creature roaming the moors.